Tired of selling chocolate or wrapping paper for your fundraiser? Our Roc-N-Rollwiches are a delicious and unique way to raise funds for your group or organization. We offer two varieties of these premium ice cream sandwiches. Our luscious vanilla Roc-N-Rollwich is edged in rainbow sprinkles, while the decadent chocolate version is finished with chocolate sprinkles. Both are sandwiched between two fresh baked chocolate chip cookies. 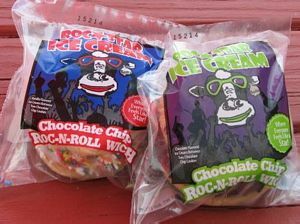 Your supporters will be more than pleased when you deliver their delicious Roc-N-Rollwiches freshly made just for them! Contact us today for more information or to schedule your fundraiser.